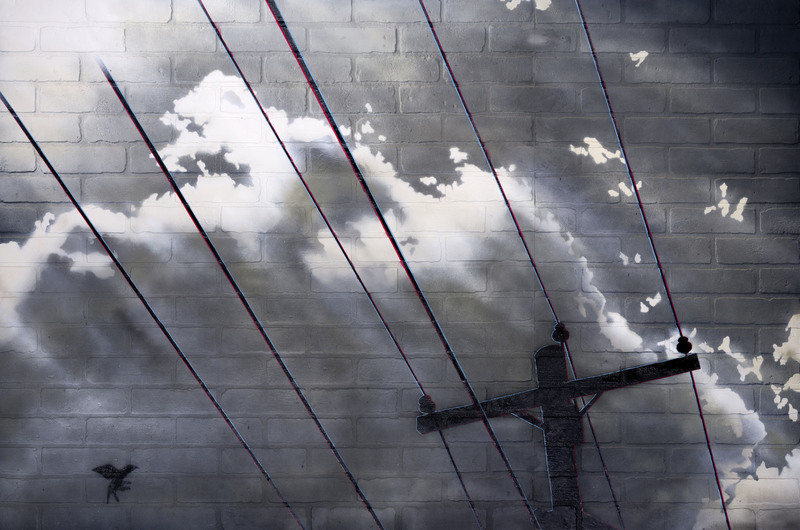 Telephone Wires. 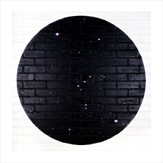 Spray paint on artificial brick. 48 x 72 in. 2011. We installed this angel on February 17, 2019, on the side of Trinity Memorial Church on 22nd and Spruce. I think the little door was originally a coal chute. We added a slot for whatever you choose. 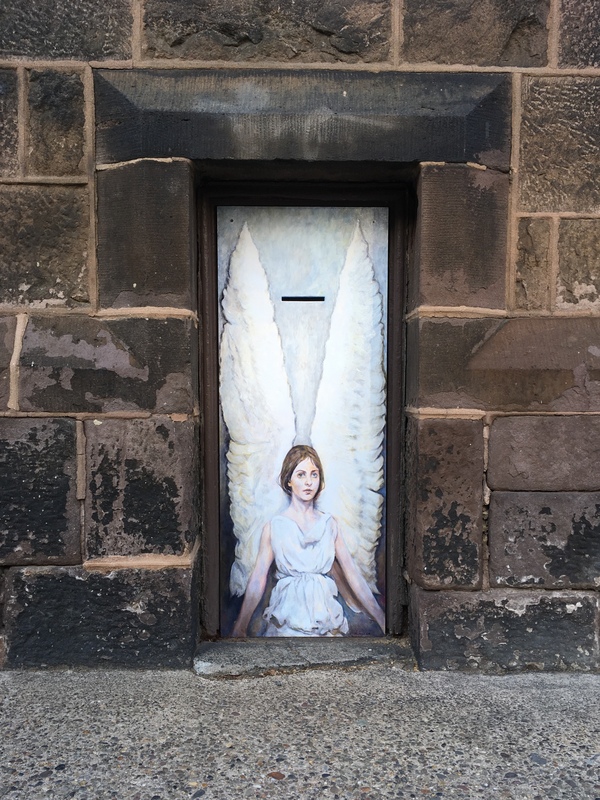 The angel was featured in Philly street-art blog Streets Dept. Thank you to Trinity and it’s rector, Rev. Donna Maree, for the opportunity and support. Also thank you to Elena Laskin for her jig saw, Rittenhouse Hardware for their know-how and typically astute advice, NextFab Studios for their table saw and generosity, Blick Art Materials for their wise observations about paints and varnishes, Abbot Thayer for the inspiration, and most of all Tracy Steen for her thoughtful ideas, incomparable creativity, and love. In my collaboration with artist and psychologist Dr. Tracy Steen, our artwork asks the question, "What is the best life?" Our projects from 2015-2018 explored (1) the intertwined paths of couples, (2) aspects of the word “leviathan” and the human relationship with the mysteries of the sea, including references to leviathan in scripture, philosophy, literature, and art, and (3) dreams about flying, invoking images of American and family history. In this project, Dr. Steen and I explored the meaning of monuments. Who among us is worthy of a monument? How can we best memorialize great actions and great people? Should monuments have an expiration date? The Wharton School, the business school of the University of Pennsylvania, granted Monument a Social Media Leadership Award, recognizing the project as an example of how to use social media to promote a more unified world. From 2011 to 2014, Dr. Steen and I explored the manipulation of history by rewriting it. 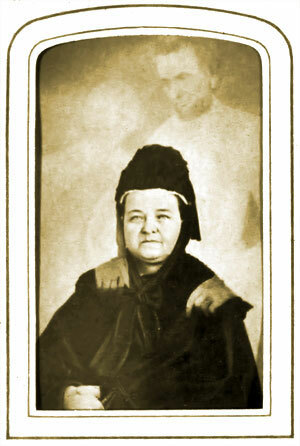 We proposed a new theory--a happy ending--to explain the mysteries surrounding Abraham Lincoln's assassination. 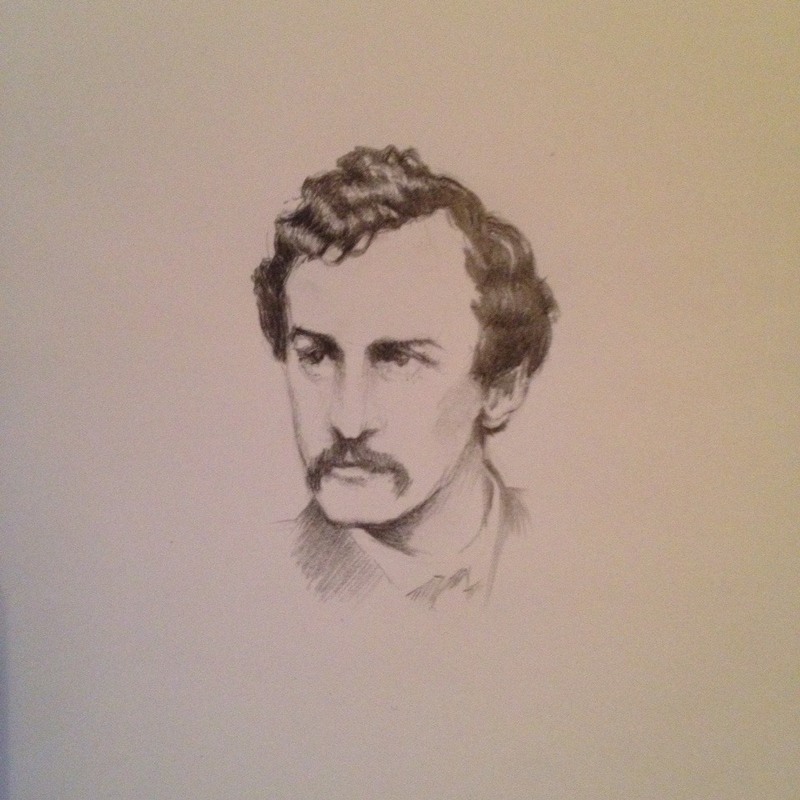 Was John Wilkes Booth actually killed in his escape from Ford’s Theatre into Virginia? In this retelling, President Lincoln’s son Willie overcame typhoid fever and was spirited away from the White House, Booth was a spy loyal to the Union along with his co-conspirator Lewis Thornton Powell, and President Lincoln faked his assassination and lived in secret. 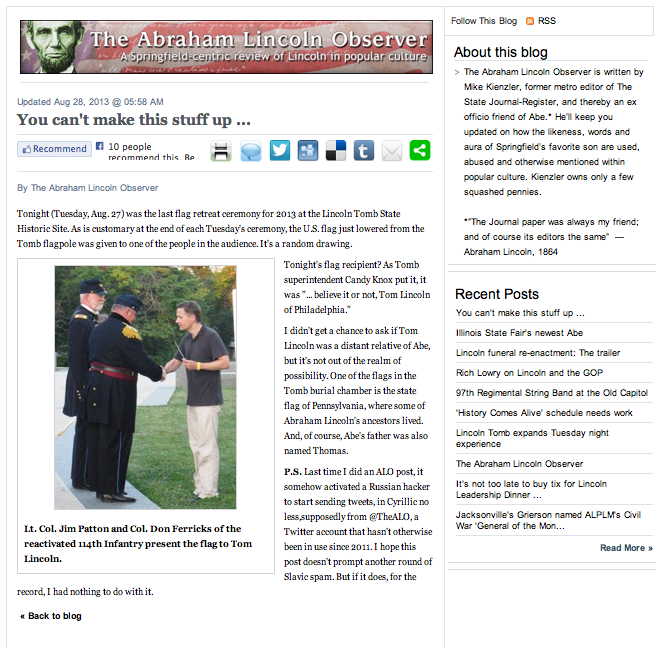 Dr. Steen and I left clues throughout the Internet and social media about President Lincoln’s legacy. Lie Counter was a free interactive art experience that Dr. Steen and I created in 2012 for Apple's iPhone®. 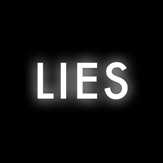 Using Lie Counter helped users become more aware of the lies they told and the lies told to them by others. 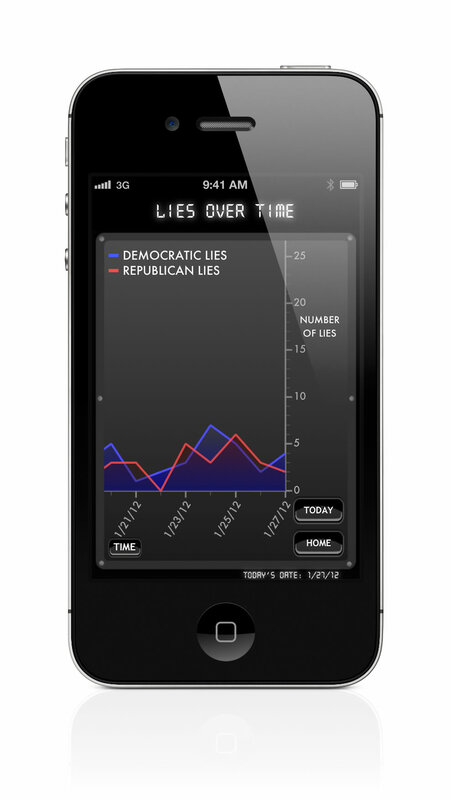 The app helped users count lies as they happened and record and graph the lies over time. To promote the app, I also shared noteworthy lies and lie-related material that I found on social media. In these exercises, Dr. Steen and I studied how red and cyan stereoptic filtering can be used to place two-dimensional objects in the foreground, midground, or background of a painting. 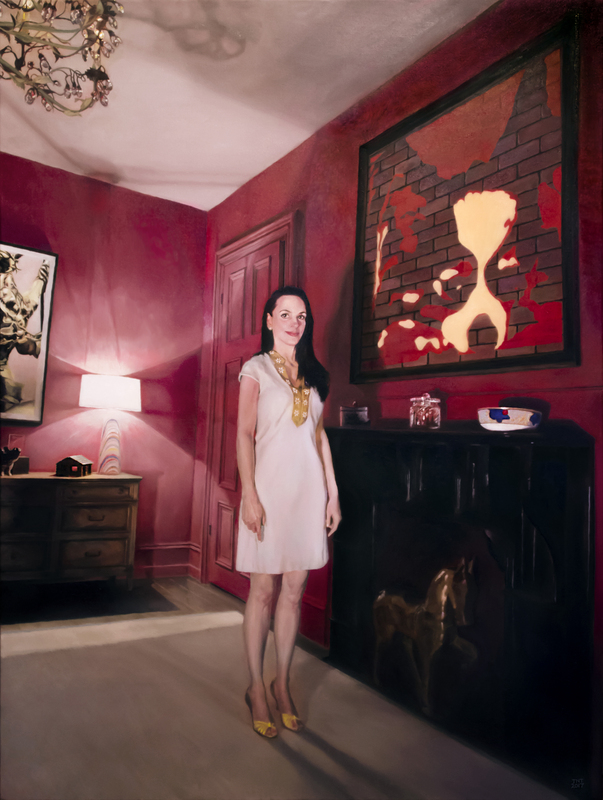 Exercises in Three Dimensions was exhibited from July to November 2011 at Giant Steps Gallery in the Rittenhouse Square neighborhood of Philadelphia. For the exhibit, we described each painting and explained how red and cyan 3D glasses work. In this series, Dr. Steen and I examined the joy of living life intensely and in the present moment, as exemplified by our dog, Serena (1999-2014). Work, Play, Rest was exhibited in April 2011 by Studio Christensen. Does your image on the internet reflect who you really are? If not, Dr. Steen and I can help. We can create an online presence that reflects the real you. 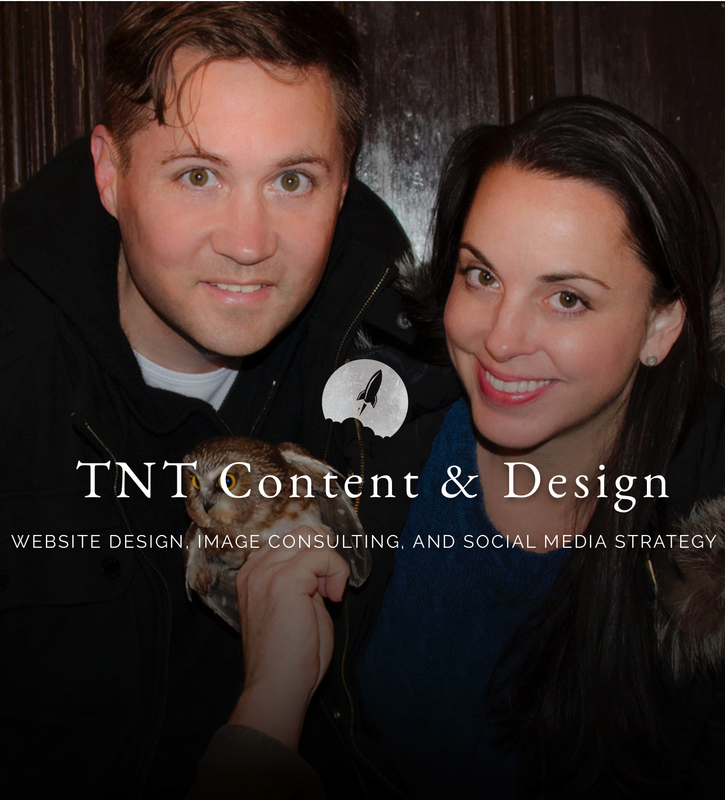 TNT Content & Design is an art, design, and image consulting firm I co-founded with Dr. Steen. We provide the one-stop shop you need for design, social media strategy, marketing, and writing. 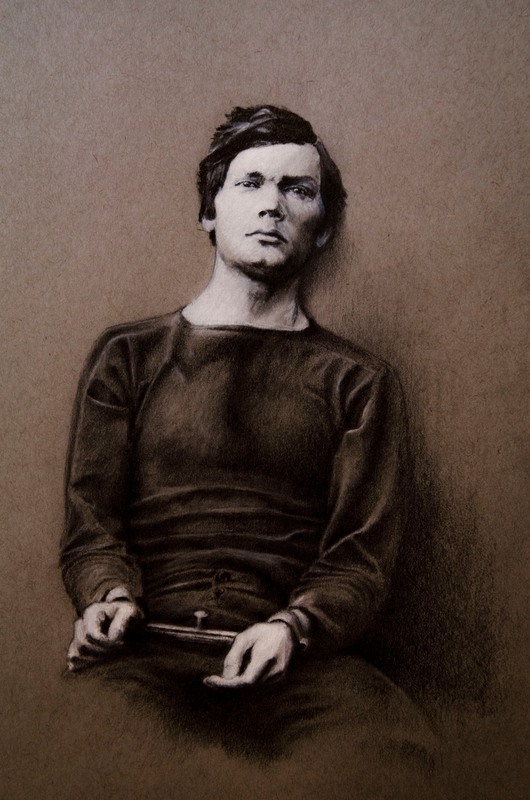 We can also produce commissioned portraits. Among other projects, we have assisted Prof. David J. Reibstein of Wharton in the creation and promotion of the Best Countries rankings—released at the World Economic Forum in Davos, Switzerland—in collaboration with U.S. News & World Report and Y&R’s BAV Consulting. We also organized the Wharton Nation Brand Conference with Prof. Reibstein. Through this international conference, we brought diplomats, executives, and academics to Wharton to discuss how a nation’s image can affect its economic prosperity. We have most recently been working with the Hon. Mark I. Bernstein (Ret.) --www.JudgeBernstein.org--to help him to publish online in serial form his novel, The Trials of a Common Pleas Judge. 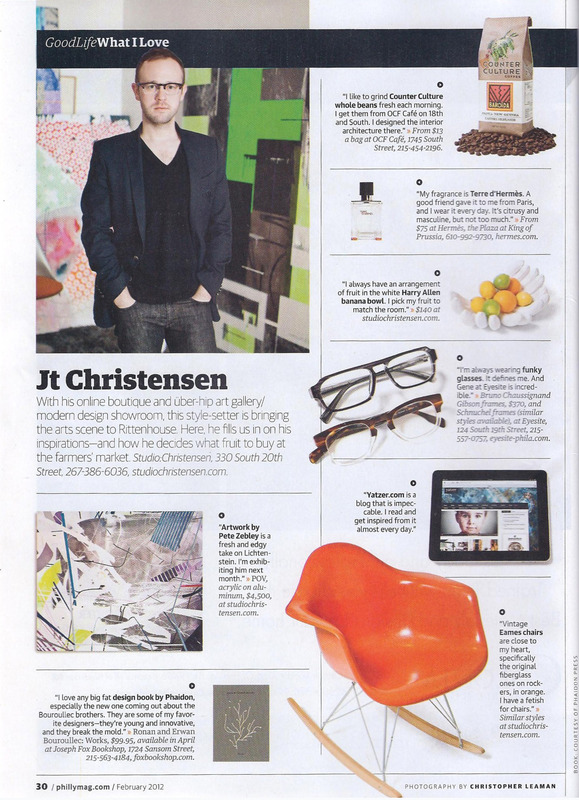 For more information, visit TNT Content & Design. 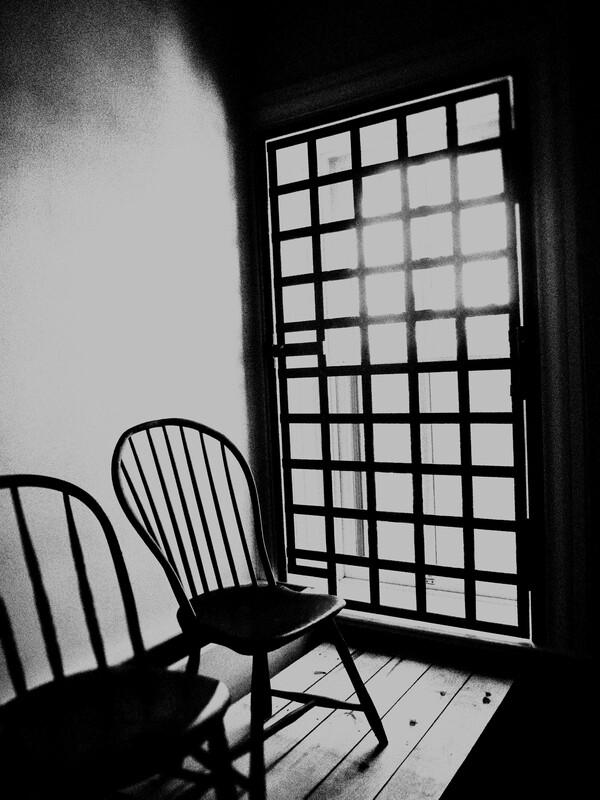 Through our venture Rittenhouse Sounds, Dr. Steen and I collaborated with two Philadelphia music experts, Max Stevens and Stephen Stone-Bush, to compile the best songs by the best new artists of 2011.